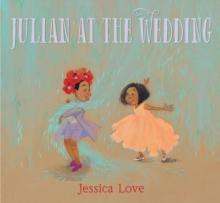 This picture book presents an affectionate portrait of an untraditional family. The story is narrated by one of three adopted children who, as a young woman, looks back on her happy childhood and recreates scenes from the sometimes chaotic but always loving and supportive household in which two women share the role of parent and mother. Naturalistic watercolour illustrations succeed wonderfully in conveying relationships within the family over a span of time and with the multicultural cast of friends, relatives and neighbours. Although it does not shy away from addressing homophobic prejudice, its positive portrayal of a different kind of family is subtle, reassuring and touched with humour:a brave and empowering book.